This latest vessel, christened Guardian 3, was built by Damen to the specs of its 3307 Patrol Vessel class, which comes with an armoured wheelhouse and accommodation for 16 persons, thus permitting operations spanning several days. The prior two vessels in the order – Guardian 1 and Guardian 2, which were delivered in Q1 2014 and Q4 2015 respectively – have been operated within the Gulf of Guinea in cooperation with the Nigerian Navy. Each boat in the 3307 Patrol Vessel class is fashioned from aluminium and measures 33.32m in overall length, 7.35m in overall width and has a depth of 3.3m at the sides. Maximum draught has been calculated at 1.95m, and personnel capacity caters for six crew members and 75 industrial workers.Other common features of this series include an axe-bow design and high-speed hull form, to enable rapid acceleration, as well as 70m² of open deck area at the aft, thus permitting the Guardian siblings to undertake cargo and personnel transfers. The 3307’s cargo deck is strengthened to 2.5tonnes per m². Guardian 3 additionally boasts 15 extra seats for crew transfers, as well as a fast rescue craft and thermal imaging equipment. 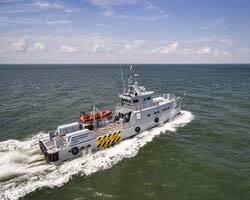 This vessel has also been fitted with a self-cleaning fuel separator, “to protect the engines and generators from contaminated fuel,” Damen says, and a FuelTrax fuel management system, to assist the crew in maintaining optimal fuel efficiency during operations. Deck equipment includes a 79kg anchor and a Heila HLM 5-2S crane. Damen says: “[These] vessels are themselves unarmed but, in the course of their duties, carry security personnel along with their firearms.” Other safety equipment includes three 20-person and two 25-person life rafts, while the engine room is equipped with a fixed firefighting system utilising Novec 1230 to prevent damage to electrical /electronic systems. Each Guardian has the capacity to carry 27,000litres of fuel, 19,800litres of technical fresh water and 2,400litres of potable water. Guardian 4 is scheduled to be delivered to Homeland before 2017 is out, and the operator has announced its intention to invest in a fifth vessel in the near future.